Sorry, didn’t mean to swear. I was just quoting the Nosh & Grog menu. 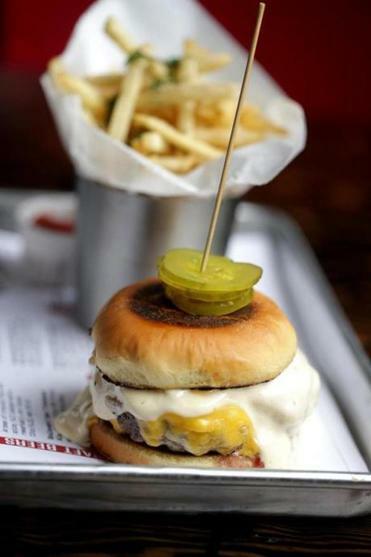 That’s the name of the signature burger, a Wagyu beef patty that comes on a potato bun stacked with white cheddar, a Kraft American single — for the sake of nostalgia, says the chef, who loves childhood tastes — caramelized onions, bacon aioli, and mesquite ketchup ($14.50). It’s gigantic, delicious, tender, juicy, and full of good flavors and textures. Also on the plate are shoestring fries that taste like the ones McDonald’s used to make before they stopped using beef tallow. They’re sprinkled with Spanish piment d’Espelette, which you can hardly taste, and Hidden Valley ranch dressing powder (seriously! the chef told me this), which you also cannot taste. But you still can’t stop eating them. “Fries are very important to people,” says chef Josh Bottini, who has worked at other places known for big flavors: Davio’s Chestnut Hill, Franklin Southie, and Spago in Las Vegas. Nosh & Grog Provisions in Medfield Center is the revamped Zebra’s Bistro and Wine Bar, which owner Craig Neubecker closed after 17 years. He wanted a more informal place where people stopped by on a weeknight. The 65-seat spot includes two dozen stools around a U-shaped bar, reclaimed wood from a Braintree barn and a nearby house under renovation, and photographs of Cuba (for sale) by Medfield photographer Edmund Prescottano. The food coming out of the kitchen makes you want to say “Bring me anything.” Sweet, plump mussels ($12) with shallot, fennel, and capers taste smoky; the chef tells me later that he cooks the mollusks in cast iron without any liquid to get that smoky flavor. They sit on a simple butter sauce. Local Stone & Skillet biscuits ($6) are sweet and fluffy, English muffins that taste part doughnut, served with honey butter and a berry jam that two of the restaurant’s dishwashers make in the summer. Gem lettuces are a little like small romaine hearts, set horizontally on the plate, sprinkled with ranch dressing and garnished with crisp slab bacon and squares of feta ($9). A green salad ($9) has beautiful lettuces — mizuna, baby red leaf, and the like — tossed with crackers made here and Marcona almonds.